These cute pom pom monster mascots may bring back memories for moms who grew up in the ’70s and ’80s. 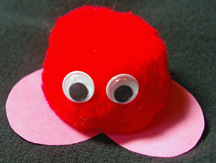 Now, kids can make their own little monsters with heart feet and googly eyes. How to Make It: Punch or cut out (using classic technique of folding paper and drawing half of heart) heart shape from construction paper that’s slightly larger than the pom pom. Glue googly eyes to pom pom. Glue pom pom to heart with the curved parts forward to they look like feet. What You Need: yarn, plastic craft “straws” (or cut up drinking straws), construction paper, heart punch (not shown) or just draw hearts and cut them out. How You Make It: Punch two holes at top of each heart. String hearts and straw beads on yarn and tie. That’s it!